Estimating backyard composting requires estimating both the percentage of households who compost, and the average pounds of food waste composted per household. I’ll address them one at a time. There’s only one way to know what percentage of households compost: survey them! No statewide survey has been done across Minnesota, but there are some data on composting in the Twin Cities metro area (Minneapolis, Saint Paul, and their suburbs). In grad school, I worked with the Twin Cities Household Ecosystem Project, which surveyed over 2,700 households in the Twin Cities metro area (specifically single-family owner-occupied homes). We asked them about pretty much everything that affects their carbon, nitrogen, and phosphorus fluxes, including whether or not they compost food waste at home. Composting rates varied greatly by city and neighborhood, but overall 18.5% said they compost. Self-reported data are always tricky to work with. People often tell you what they think you want to hear, or how they want to see themselves. Composting is good, so people are likely to err on the side of saying “yes” even if they don’t really compost. I’ll let my social science colleagues tackle quantifying that uncertainty, but for my purposes I’ll take 18% as a reasonable estimate for composting in the Metro area…..at least for folks living in single-family houses. I would expect that the composting rate among apartment-dwellers is much lower, and while composting is certainly feasible in a duplex with a backyard, I don’t have any data on duplex-dwellers to see if they behave similarly to people in single-family houses. It’s the limitation of only having data from one study that was designed for very different purposes. Since I want to come up with a defensible lower bound, to know that at least this much food waste gets composted, I decided to assume that duplex/triplex/apartment dwellers don’t compost at all, even though I know it’s not true. But I do know for certain it’s an underestimate! The Metropolitan Council estimates that in 2013, there were 703,806 single-family houses (out of 1,207,611 total housing units) in the seven-county metro area. At 18% composting, this gives 126,685 households who compost.But what about the rest of the state? I wouldn’t expect that people in the cities, suburbs, and rural areas all compost at the same rate. Fortunately, the TCHEP study was designed to sample along an urban-rural gradient, so I have some insight into that variation. The north end of the study, about an hour’s drive from the city, is getting pretty rural and includes some areas with very low population density. Biking through there, I’ve seen signs along the road like “For Sale: COW” that you certainly don’t find in the city! Households in higher-density areas (city folks) are more likely to compost than households in lower-density areas (country folks). It seems pretty straightforward from here — take the housing density data for Minnesota, and use the regression to predict the percentage of households who compost. I can’t say for sure that people outside the metro area are as likely to compost as people in similar-density areas inside the metro, but it’s a reasonable starting point when extrapolating. Unfortunately, there’s a catch: I only want the density for single-family houses. Minnesota’s housing units range from single-family houses to high-rise apartments, many of which are higher density than single-family houses. In fact, the average density for the full statewide dataset comes out slightly higher than the average density for the TCHEP households, which are all in the densely-populated metro area. But how to sort out only the single-family houses? Digging around in the Census data was absolutely no help. In cases like this, it’s often useful to go to the extreme and ask what the lowest possible value could be. What if the 1.4 million single-family homes were the least-dense 1.4 million housing units in the state? This scenario gave me a cutoff density of about 650 households/km². 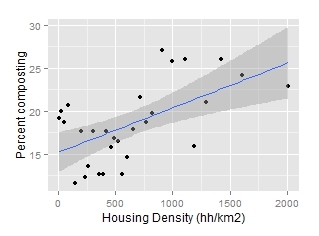 The TCHEP data clearly show that this isn’t the case — a number of the TCHEP households are in areas with housing density up to 2500 households/km² — but it’s the lowest density physically possible, which makes for a very convincing lower bound. Using the regression with only these areas estimated 16.4% composting, but it’s not a good practice to use a regression derived from a dataset with a much wider range of housing densities. Sometimes a trend within a small section of the data can be quite different from the overall trend. So to cross-check, I went back to the TCHEP data and looked only at the subset of households in areas with housing density up to 650 households/km².These households have a composting rate of 16.1%. Even though it sounds high, I’m pretty confident that 16% is a reasonable estimate for statewide composting. For 2013, the Census estimates 1,857,069 single-family households in Minnesota. Sixteen percent equals 297,131 households composting food waste at home. Given that I’d estimated 126,685 composting households in the metro area, this leaves 170,446 non-metro composting households (14.8% of non-metro single family houses — the metro area has 54.4% of the state’s population, but only 38% of the single-family houses). For an overall rate, not just among single-family houses, these composting households contain 12.6% of the state’s population. For the second part, I need some way to estimate the average pounds of food waste composted, if a household composts. This isn’t easy: I compost, but I couldn’t begin to guesstimate the poundage that goes into my bin each year. If I take the midpoint of each category (so “25% to 50%” gets taken as 37.5%), on average about 58% of food waste gets composted. This is way too precise given the original broad categories in the data, so I rounded down to 50%. All the caveats above about self-reported data apply here; I’d guess that people probably overestimate the amount they compost. But again, it’s the best data we have, so I’ll use it as a starting point. The last piece I need, then, is an estimate of the average amount of food waste produced at home. The best way to study this is to sort through people’s garbage and see what they throw out. A 2013 study in Minnesota found 191.6 lbs/person of food waste in garbage annually, but they didn’t do the detailed tracking to separate residential waste from industrial/commercial/institutional (ICI) waste. For that, I turned to a similar Minnesota study conducted in 1999, but which looked at residential and ICI garbage separately. They found that 54% of food waste in garbage was from residential sources. I assumed that this percentage stayed constant even as the amount of food waste in the garbage increased, to estimate that people threw out 103.5 lbs of food waste per person per year. Not all food waste ends up in garbage, though. I have data on food waste getting fed to livestock (probably none of it is residential), in mixed-organics municipal composting (some is residential, but since I don’t know how much, I left it out), and going down garbage disposals (average = 17 lbs/person annually). Doing the algebra to include the not-yet-known amount of food waste (12.6% of all people compost 50% of their food waste, so 6.3% of all residential food waste gets composted), it cranks out to 128.6 lbs/person total food waste produced at home. The average household size for single-family houses (again, from TCHEP data) is 2.3 people, so I’m estimating 295.8 lbs of food waste per household per year — and a composting household therefore composts, on average, 147.9 lbs. What’s this mean, statewide? About 21,500 tons of food waste get composted in people’s backyards each year — not an insignificant amount! As a rough guess on volume, that’s enough to fill over 850 semi trucks. That’s a lot of food waste staying out of landfills (where it would decompose to produce methane, a potent greenhouse gas), and a lot of nutrients getting recycled to people’s gardens. Or with distance from the city center, which is highly correlated with housing density. Density seems to be the better predictor of the two. For reference, these housing density estimates are from the 2000 Census, as processed by Hammer and coauthors into partial block groups of relatively homogenous density.